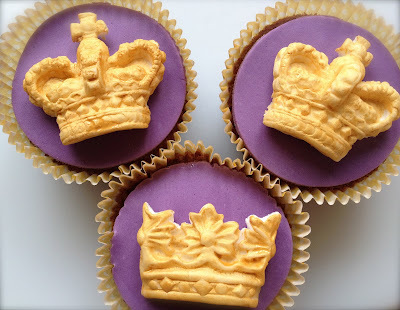 Here is my interpretation of Jubilee Cupcakes, and not a Union Jack in sight. I have been busy producing sugar paste royal crowns, using the new mould I told you all about last month. This was my first use of lustre powder, which you mix with a little vodka and brush on to the crowns. I'm still perfecting the technique, so don't look too closely. I thought rather than do the whole red, white and blue theme, I would use the more traditional regal colour of purple. Which, I think really sets off the gold crowns wonderfully, along with the matching cup cases. Don't worry though you can expect plenty of red, white and blue cakes in the coming weeks for the Jubilee. For those interested the cakes are chocolate chip, I used up left over mixture from my Rhubarb and Chocolate Pudding recipe. I am posting these cakes for the Blogging Jubilee Baking Competition over at Homemade by Fleur blog. This competition is being sponsored by Appliances Online, with an amazing prize of £100 Amazon vouchers! Thanks Suzanne the purple really caught my eye too. What a fantastic entry into my Jubilee competition. The crowns look amazing and very effective. Gold and purple are a great combination too. I'm looking forward to seeing all the entries there are lots of talented baking bloggers out there. love the crown moulds, we sell them at Faircake and cant wait to get my hands on a packet! EEEEK! I love these! Very pretty indeed! Really wish I'd had one of these moulds! They look so regal! Sarah you must buy one, they are fabulous! So glad you like them, and welcome to my blog. Do let me know if you bake the recipe. Thanks Laura, the mould is wonderful ! Thanks for dropping by and leaving me a comment. They just taste of sweet sugar paste, which has harden slightly. The vodka used to mix with the dust does not leave any taste. Do let me know if you make them, would love to see them.